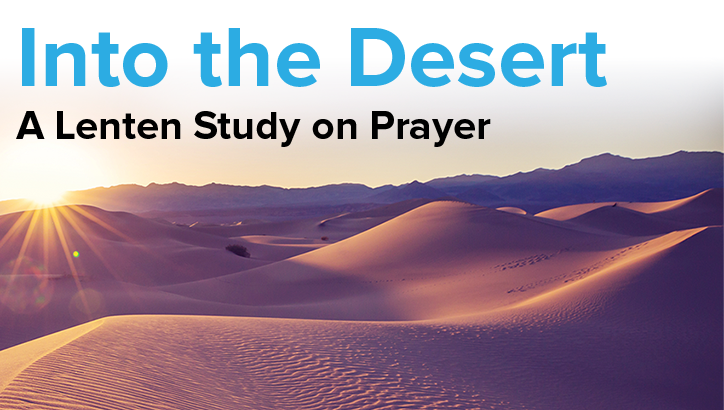 This Lent, teach your community members to pray intimately with God with Into the Desert—a 6-week video-based study of Augustine Institute’s original Scripture study, Lectio: Prayer. Begin preparing your implementation of this parish-wide study by readying printable resources to help spread the word in your community! Pass the collection baskets around the pews a second time, this time filled with Into the Desert business cards for parishioners to take home, or pass out flyers in the narthex. Note: These promotional resources include a space to enter your Custom Registration URL. This custom FORMED website address is the simplest way for your parishioners to create their free FORMED accounts in order to participate in the study. If you have not yet created your Custom Registration URL, learn how by watching a tutorial here. Prior to the start of the study, pique your parishioners’ interest with a pulpit pitch announcing the study, a parish article in your bulletin, and by showing the Lectio: Prayer trailer after Mass. Purchase the Lectio: Prayer Study Guides at the discounted parish rate to help your parishioners go deeper each week or download each session’s guide from FORMED and print in-house. Why might I purchase physical study guides? Study Guides remain, and will always remain, free for download with your parish FORMED subscription. However, in an effort to make it even easier for your parish to utilize these fantastic materials, we offer extremely attractive prices on printed, full color Study Guides for Augustine Institute Studio programs for all FORMED parishes. The prices are so attractive that most parishes will find that they can get a full color Study Guide for about the same price as printing/copying in house without the hassle or labor involved. In a parish-wide study, small groups, individuals, and families are free to go through the study how they want. Some Bible studies or small groups may choose to meet in the home or at the parish, families may watch a weekly episode after dinner, or the parish might host everyone for a fish fry and weekly episode. Keep your parishioners engaged throughout the length of the study and grow as one family under God by incorporating the theme of each episode at Mass every Sunday. Ask Father to preach on that week’s episode in his homily, and include reminders in your bulletin. Encourage the members of your parish to discuss each week’s episode in a FORMED Community discussion group. Get the discussion started in seconds by adding the pre-made Into the Desert template to your Community page! Find this customizable template, complete with each week’s episode and discussion questions, in the Template Catalog found on your leader dashboard. 4. Conclude Into the Desert with a celebration for the whole parish! During Easter weekend or another time that works best for your parish after the conclusion of the study, invite your parish family to a celebration where individuals have the opportunity to meet new people, share their experience of the study, and encounter God in the Sacrament of Reconciliation. We at FORMED will be praying for your parish this Lent! Want more direction? Watch this in-depth webinar on running Into the Desert as a parish-wide study! One of our FORMED Implementation Specialists will walk you through the Into the Desert program, promotional materials, and utilizing custom content and FORMED community for a parish-wide study. Also hear about other offerings from FORMED this Lent!